Like old fashioned art? Well, Upper Deck has a set just for you! 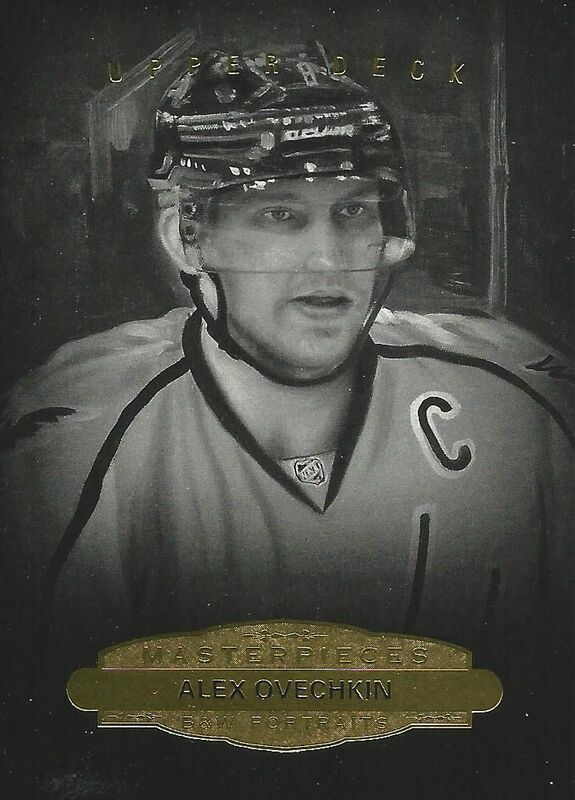 It's the just released Masterpieces set that features all-painted images of NHL players new and old. This art concept isn't anything new, but it's been a few years since Upper Deck has had a full-on release of cards of this type. I, for one, was surprised they chose to bring them back. Let's go ahead and critique some of this artwork, shall we? As I stated before, this release is packed full of classical looking art images. If you're a fan of the look, I guess they're 'ok', but for me the design is dated. Upper Deck had a release like this a few years back that I think was actually done better than these. The Masterpieces cards come in both vertical and horizontal orientations. No matter which way they go, the left and right edge of the card is lined with an ornate gold foil. This golden border reminds me of an old picture frame - one of those you might find at an old lady's garage sale. It's just an old look that seems to belong in the past. And I'm not talking retro either. This set feels like it could have been a marginal release 7 or 8 years ago. If the art was better on the cards I think the design issues may not be as crucial, but sadly the art doesn't impress much either. It's just all very bland. The back of the base card is strong. Definitely stronger than the front design in my opinion. 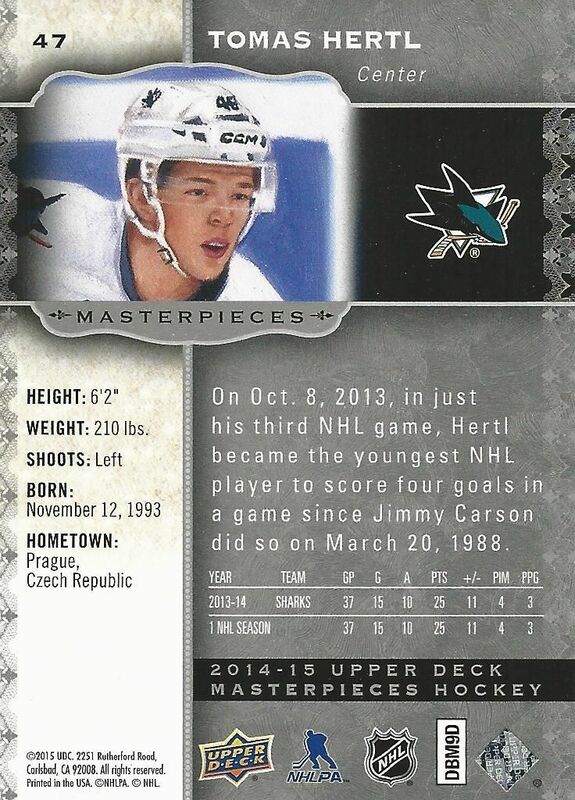 The back of the card features some nice information about the player on a shiny silver background. While the front of the card looks stuck in the past, the back has a past feel with a modern look. In terms of ease of reading, the back works nicely. All the information and stats are placed in a way that makes sense. While I do like the card backs, it's sad that I like them better than the fronts. The rookie cards in Masterpieces don't do a whole lot to stand out from the crowd. They simply get a 'Rookies' label underneath their name to designate their status as a first-year player. I am guessing that the rookie cards may be a bit more short printed than the standard base card as I only received a few in the box I purchased. Rounding out the base set are the B&W Portrait cards. This subset is my personal favorite looking card of the entire set. The simple all black vignetting and gold foil are perfect here. I would have been very happy having this be the base card design. It's a classy look that Upper Deck could have really capitalized on. Man! The set would have been great like that! The box states that collectors can find three autographed or game-used memorabilia cards per box. That works out to a hit in every five packs. Most likely you'll find one autograph and two jersey/patch hits. Boxes run around $100, which is sort of the standard for that amount of hits. Collectors will also encounter parallels and some insert cards as they bust their packs. Wire Photo cards are an insert type that Upper Deck has released before. Though the photos used on their cards come from a more modern era of hockey than their first release, these cards have a bit of an older feel to them. 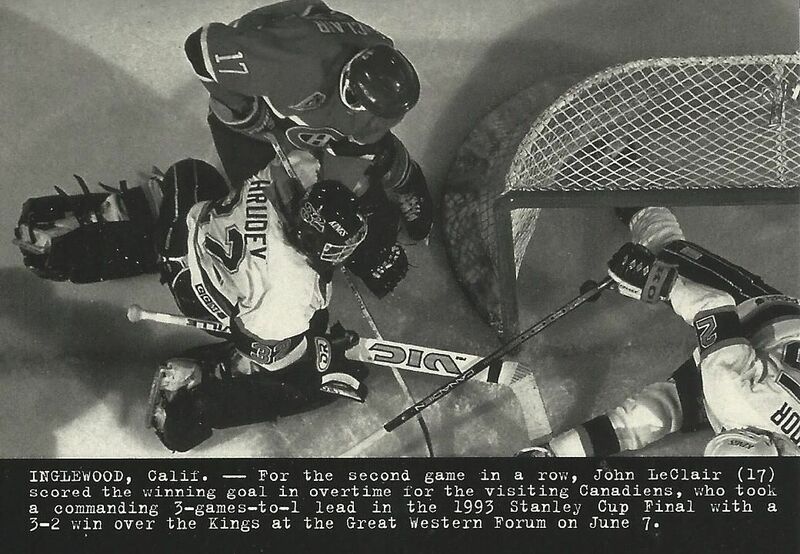 I think it's because Upper Deck chose to go with a black background on the written part of the card. It just makes the entire think look too dark. There's not enough contrast. When looking at these cards, I sometimes have a difficult time seeing what's going on in the photo. I loved these cards in their other release, but these have taken a step back. Textured red bordered parallel cards serial numbered to 100 are also in the packs. These are just a parallel to the base set, but are distinguished by a red cloth border along the golden foil sides. The foil and red border are raised to give the card a more three-dimensional feel. The backs of the cards are also in red. Black leather parallels also can be found. These cards are serial numbered to just 50. The regular jersey card I pulled out of this box was of Lightning goalie Ben Bishop. The card appears to be a parallel of the base set with a spot on the card cut out for the jersey piece to be inserted. Rather than having a gold border, these jersey cards have silver ones that actually look better to my eye than the gold did. The back of the card states that the piece was game-used, which is nice. 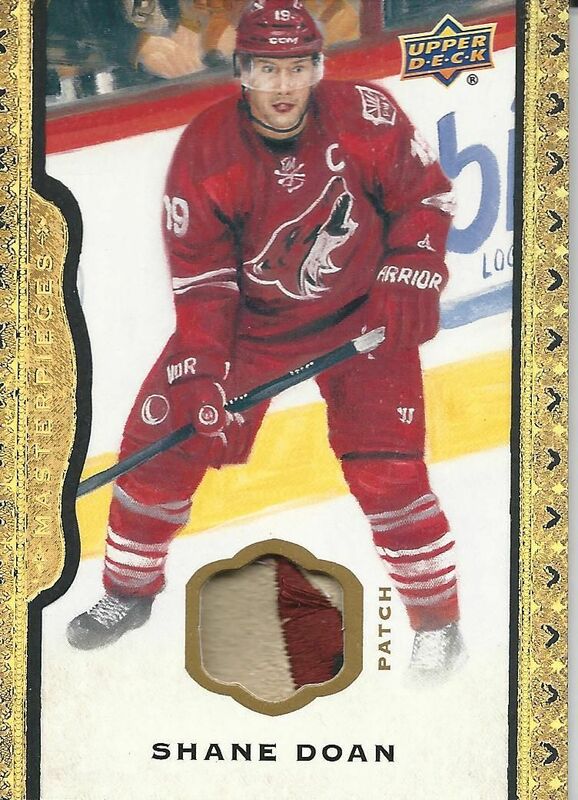 The Shane Doan patch card shown above is black ramed leather prime memorabilia numbered to just 35. It is much thicker than the regular jersey, but has the same basic look as the rest of the base set parallels. The patch in the card is very unique, and has an interesting texture to it. This Doan card is probably my favorite card out of my box. The autograph I pulled was an on-card auto of Brendan Gallagher. 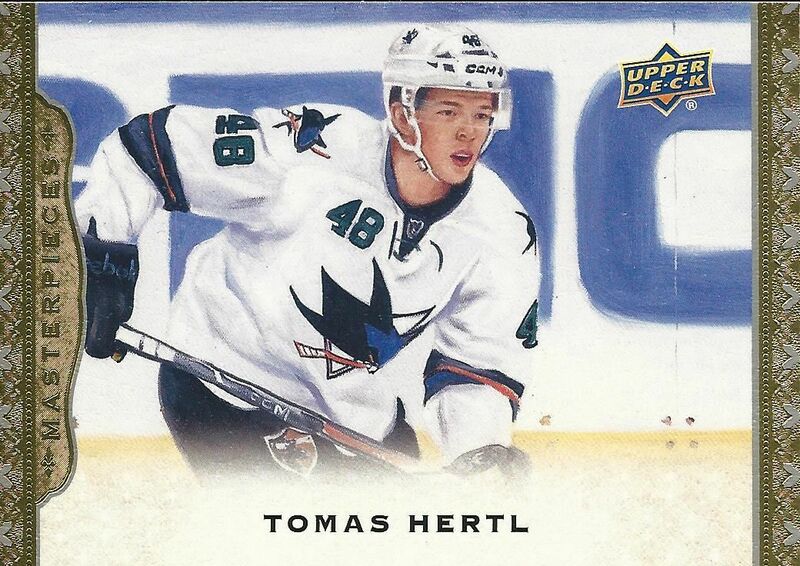 Like the regular jersey card, this one has a silver border as well. The autograph is in blue ink and is not serial numbered at all. 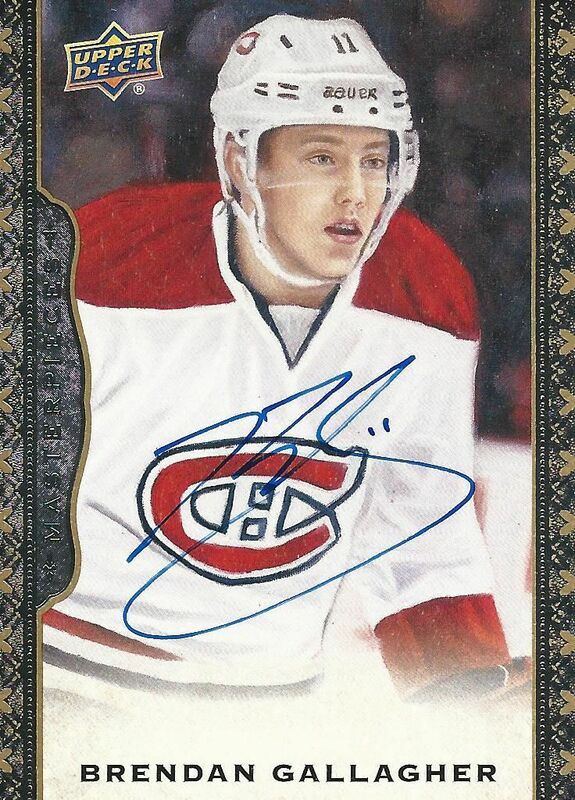 Some autographed cards have been short printed in comparison to others, and collectors can find autographs on the B&W Portrait cards as well. Most of the insert, memorabilia, and autographed content in Masterpieces is a parallel of the base set or its base insert. If I were to be able to pull any card from the set, I think I would like a Wire Photo autograph. Those cards, even though I don't think they are as nice as before, are still cards that appeal to me. The Masterpieces brand is one that I think Upper Deck could have left out of this year's line-up of cards. These cards definitely have a different flavor than anything else that has been released thus far, but I just don't see these cards having a lasting appeal. I got my box for about $100. I know that my three hits from this box will not get me close to what I paid for it. Actually, I'm not sure if much will get you close to what you pay for this box on a regular basis. If you're like me and have to try everything once, I'd just go ahead and get a box. But if you're ok with missing out on a product here and there, this is one you can probably skip. I preferred the look of the 08-09 Masterpieces (With canvas base cards). Also, I have seen a lot of white swatches for this year's Masterpieces, which, well, could be better! Still, you got a nice Gallagher auto and Doan patch! Nice break! I actually like the look of this product! Awesome patch card by the way! 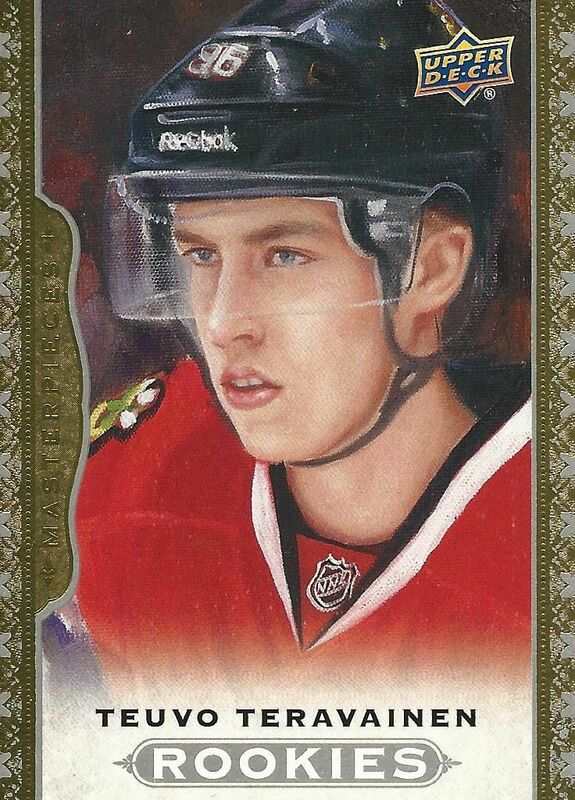 Nice review as always, on card auto of Gallagher is pretty good! + The B&W Portraits cards look nice, and would've been a better base set I think. + On card autos is always appreciated. - Some portraits do not look like the player at all! - The gold border do not look good, it would've been better to give a (good) painting more space. That patch is nasty ! Great doan patch! Nice patch on it too! Thanks for doing a review on Masterpieces! It was (and still is) a product that I really looked forward to and so far the breaks have been fairly decent. You hit the nail on the head with the description of the cards - "one of those [frames] you might find at an old lady's garage sale" but the addition of relics on the cards, whether they be jersey swatches, patches, autos, or sticks really contrast the overall design which makes the hits easier on the eyes. Love the Gallagher and the artistic look of the cards. I agree with you on the border design somewhat taking away for the overall look of the cards. I don't like how the hits are pretty much a base card with either a swatch or an auto. I think this will be one the products that I personally wouldn't actually buy a box of. Nice review! I'm not a fan of the gold foil siding but there very generous with the patches. I was really looking forward too this product but I am a little disappointed! I wish they would have done something better with the rookies! Great Masterpiece, and great review! Nice product and box. Great hits! For some reason I actually like the design of these cards. LET'S GO LIGHTNING! I like this product. 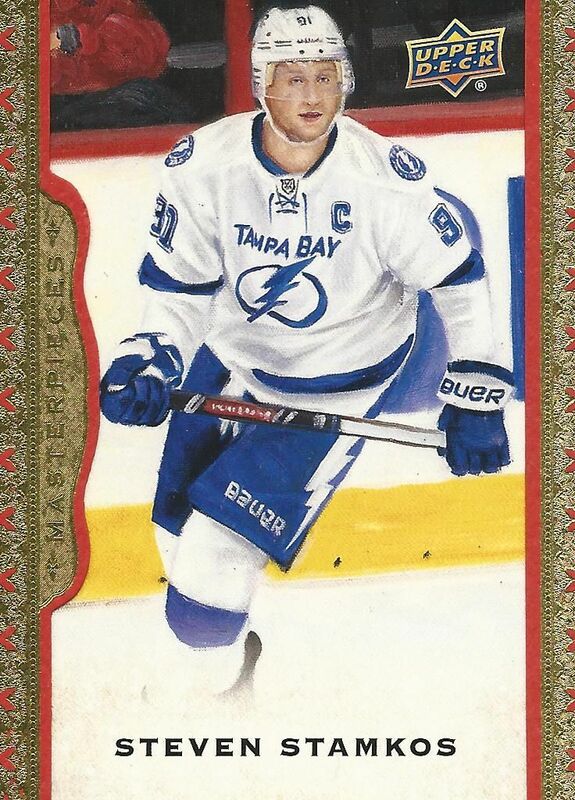 I liked the UD Masterpieces hockey before this one came out. I wish it had the same canvas feel though. I pulled a wire photo auto of Ondrej Palat at my card store. You could barely see the auto however, it's still pretty cool and unique. Looks like a nice product, I will definitly be looking for some of the autos from this product on ebay! 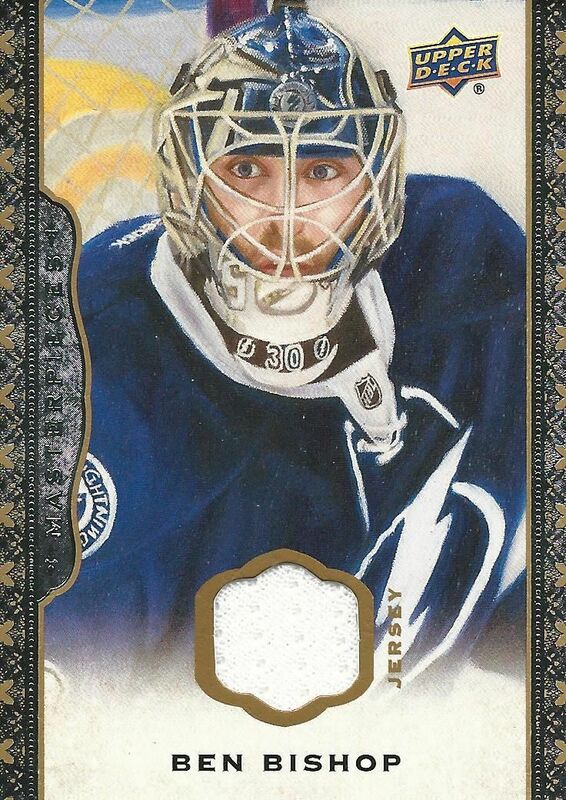 I agree that the old wire photos and wire photo autos are better looking (one of my favourite designs actually) Had they had the current cards' auto in gold ink it would save the card a bit, but it is in blue.. which dissapears and looks awful... Nice Break though!